FILE - U.S. Immigration and Customs Enforcement (ICE) agents arrest foreign nationals, Feb. 7, 2017, in Los Angeles. Under the Trump administration, ICE has been directed to pursue deportations aggressively, with a particularly strong focus on Cambodians. Until last Friday, Soeun Neat had been tearfully preparing her children for their father's deportation from the United States to Cambodia for a 20-year-old criminal conviction. Her husband, Sear Un, had been detained under a controversial resettlement program that has seen hundreds of Cambodians who have settled in the United States — mostly refugees — deported for felony convictions since 2002. It had been a miserable few months for the heavily pregnant Neat since Un was detained by U.S. Immigration and Customs Enforcement on September 5. "Most of the nights I would cry myself to sleep just because it was hopeless. You know how can I help my husband if I have no knowledge about the legal system." Helpless and despairing, Neat luckily found someone with a forensic knowledge of immigration law, Asian Law Caucus staff attorney Kevin Lo, and her husband's fortunes began to change. ALC and its affiliates are litigating a class-action lawsuit challenging the re-detention of Cambodians with final orders of removal and have secured stays for at least 15 of them since October 2017. Un was convicted in 1998 for residential burglary — then considered an aggravated felony. He stayed in the car during the actual theft and was offered a misdemeanor charge but took a felony instead so that his friend, who already had a prior conviction, could avoid a second strike. After Neat got in touch in September though, Lo and his team quickly recognized that Un's charge had been reclassified and was no longer a deportable offense — opening a ray of hope. On Friday, Un was granted a last-minute stay before a plane loaded with some 40 Cambodian deportees took off for Phnom Penh from El Paso, Texas, the following Tuesday. Lo said they were able to secure stays for five of the Cambodians scheduled to be deported on that flight — which carried one of the largest groups of deportees ever sent back. "I would say that it is absolutely certain that there are other people on board who could have reopened their removal orders," Lo said in an email. "Asian Law Caucus attorneys have taken on clients from Northern California and the Central Valley of California in each ICE raid, and we have always identify people with options and then successfully help some of them fight it out in the courts." Under the Trump administration, ICE has been directed to pursue deportations aggressively, with a particularly strong focus on Cambodians. In 2017 Cambodian officials, who have routinely expressed disgust at the program, started refusing to accept deportees. But their defiance was short-lived. ICE Public Affairs Officer Brendan Raedy told VOA visa sanctions imposed on Cambodia on Sept. 13, 2017 due to this "lack of historical cooperation" had yielded results. "As a result of these sanctions and ongoing diplomatic efforts, removals to Cambodia increased 279 percent from Fiscal Year 2017 to Fiscal Year 2018." Cambodian officials could not be reached for comment for this story. ICE has reported the deportation of 110 Cambodians in the 2018 fiscal year. Raedy said that "despite this progress" there were still 1,855 Cambodian nationals present in the United States with a final order of removal, of whom 1,362 were convicted criminals as of September 17. But as the deportation raids and pressure escalate, so does the resistance. ALC attorneys have been identifying deportees in Phnom Penh who they believe have strong arguments to have their cases reopened. In November, Phorn Tem, a Cambodian deported in April for a possession of marijuana for sale conviction, became the first deportee allowed back into the United States. A day after he was deported, Tem's conviction was overturned due to a very common issue in Cambodian deportation cases — a judge found he had not been properly informed of the immigration consequences of pleading guilty. ALC used this ruling to reverse his deportation order and hopes soon to help make him the first Cambodian deportee to be issued a green card. They are hoping more of those on Tuesday's flight will follow in his footsteps, thanks to pardons that have been requested from outgoing California Governor Jerry Brown. FILE - California Gov. 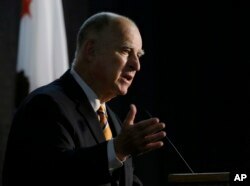 Jerry Brown speaks at a forum in Sacramento, Calif., June 29, 2018. "Even though the flight has left, a gubernatorial pardon could bring people back, erase their convictions and reverse their deportation in a very real sense," Lo said. With her husband still detained but safe from deportation at least until May, Soeun Neat's hope of reuniting her husband with her children rests with Governor Brown. "This Friday, December 21st I believe Governor Brown will announce the pardon because on Monday it's going to be Christmas eve and I don't believe the governor will come out on Christmas eve to announce it," she said. If that does happen, Un will be home two days late for his daughter Soraneen's fourth birthday, but at least in time for Christmas.